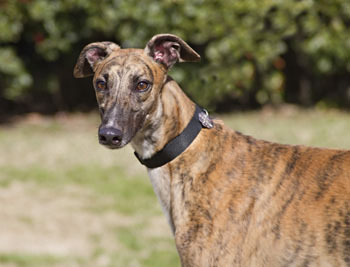 Angel, aka CSL Wild Angel, is a 4-year-old brindle female born October 18, 2008. Her sire is Craigie Whistler and her dam is Y Knot Cady. 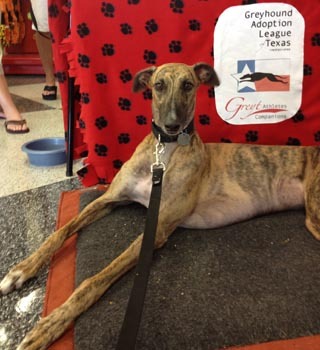 Angel has 35 races to her credit on Greyhound-data.com, all at Gulf Greyhound Park - she was quite the racer, competing in the AA class! Her record of races starts on October 8, 2010 and ends on April 28, 2011. 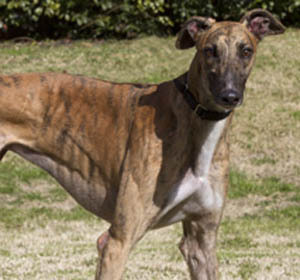 She broke her leg in November 2011, and it was repaired, however she is suffering from complications due to a bone infection and joined the GALT family to receive necessary treatment. In spite of aggressive treatment with antibiotics, Angel's infection weakened the bone to the point where the only option was to amputate her leg. She is all healed up from that surgery, and is ready to hop right into her forever home! Be sure to meet this little girl soon! Angel is not cat tolerant, and should not live with tiny dogs. Angel, couch potato extraordinaire, is one relaxed, quiet greyhound. She is happy spending her day in tranquility mode sprawled out in the many dog beds she owns. 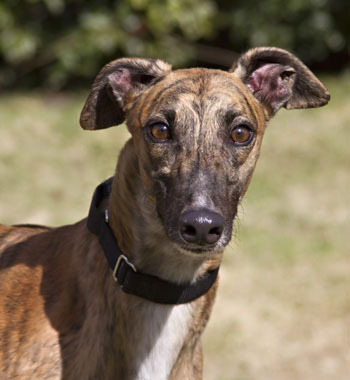 She really is an Angel - thriving on attention and is friendly with other medium and large dogs. She is too attentive with small dogs and cats to live with them. Angel gets along fine on 3 legs. She would do well in a carpeted home. The carpet provides traction and makes mobility easier. Angel is perfectly house trained and crate trained.